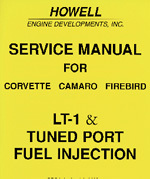 By Bill Howell, Former Chevrolet Performance Engineer If you own or plan to install a TPI fuel injected engine, you need this manual. You can troubleshoot all computer control systems to get your engine running or sort out problems. Includes basics on how the system works, plus all the trouble codes. Allows diagnostics with only a test light and a digital volt meter.